Life exists in the space between moments. In the look on a face, in the music on the jukebox in the background. When you realize your life’s been on pause, you’re faced with a choice: embrace change, living every moment as if it were your last; or stay the course, because it’s all you know how to do. If you decide to stay, perhaps you’ll take one night off to listen to the music. The Band’s Visit is an achingly beautiful musical where nothing exactly happens. Yet so much is there, so many emotions wrought into every moment. The book by Itamar Moses is careful and measured, with long scenes that have fulfilling, complete dramatic arcs. Everything is filtered through various thick accents and stilted English, slowing the whole show down and rendering the script into its most essential elements—when nobody speaks the same language, everyone communicates at a more basic, primitive level. While the form of the words holds the audience at arm’s length, the broken English paradoxically brings us closer. It helps us feel what the characters must feel. The effect is wonderful. 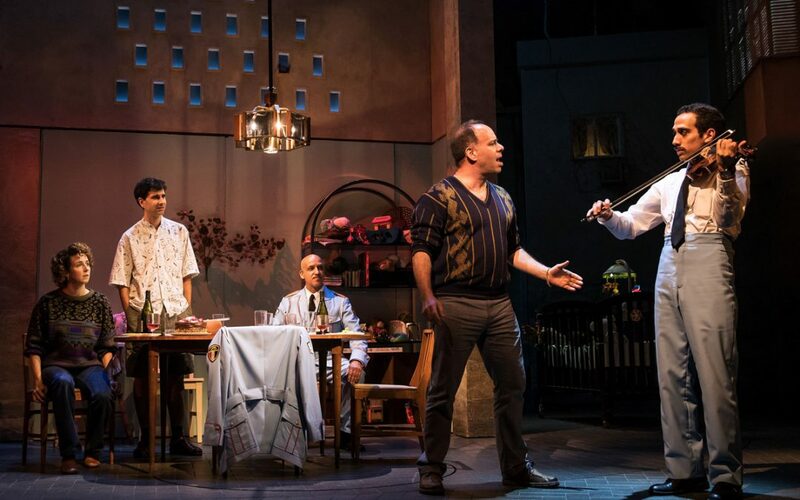 David Yazbeck has created a masterful score, blending authentic Middle Eastern sounds with a hint of Broadway. His TV and film experience greatly benefits the show, as many of the best moments make use of underscore and the interplay between music and the actors. There’s a feeling of drifting languidly between the scenes. Every now and then something pops at you, some poignant moment or especially beautiful passage of music. The emotions build along with the score, and the climax of the finale is one of the truly great moments in musical theatre. Katrina Lenk steals the show as Dina. She is a powerhouse, delivering a strong, snide character with equal parts grit and vulnerability. She is instantly relatable to the audience, and her performance is a joy to watch. Dariush Kashani (Tewfiq) is delicious as her straight man foil. You can feel the measured motions of his baton playing out in his posture, in his words, in the way he’s lived his life. He opens up throughout the course of the show, and his final reveal is devastating. The show makes use of on-stage music to great effect, integrating the character’s instruments in believable and effective ways. For a show about a band, we never lose sight of the fact that these are first and foremost musicians. They’re talented, too—and they prove it in a live number after the curtain call. This is a show about the universal human experience. About love. About mistakes. About what can happen in a single visit. And even though the band leaves at the end, and life in Bet Hatikva proceeds as it once was, everyone leaves a little bit better for the experience. The great moments in the show are fleeting, like the lives they are meant to represent. You yearn for them to return, but they have already passed you by. I sometimes say that you can predict award winners by how much they make you cry. By that measure, The Band’s Visit is sure to win Best Musical. It deserves that honor. I fear that it may not have a marketing plan to keep bringing in the audience, but perhaps the Tony will be enough to keep it going. The audience wasn’t quite sure what to make of things at the top of the show, but by the end they’d all been swept aboard. The Band’s Visit is playing at the Barrymore Theatre. *As of June 2018, the role of Tewfiq is being played by Dariush Kashani instead of Tony Shaloub who originated the role. Dariush does a magnificent job.